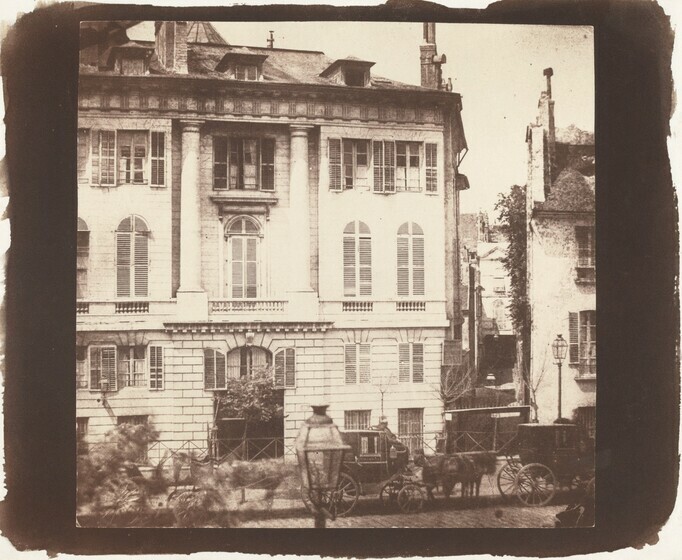 Upon his arrival in Paris in May 1843, the photographer William Henry Fox Talbot wrote to his mother that "I never saw Paris look so well and gay." In this photograph, Talbot's composition balances the elegance of the architecture with the blur of passing carriages and the intrusion of lampposts to demonstrate the camera's capacity to capture fleeting motion and to chronicle, as he wrote, "whatever it sees...with the same impartiality." His lens is as fast as movement. He has seized with an incredible vitality a market scene...the dockers walk, the merchants raise their hands, the chickens tremble under the hand that holds them....It is life itself, and Nègre has stopped it in a hundredth of a second. An extraordinarily talented photographer, Gustave Le Gray worked in many genres, including landscapes, portraits, marine views and cityscapes. 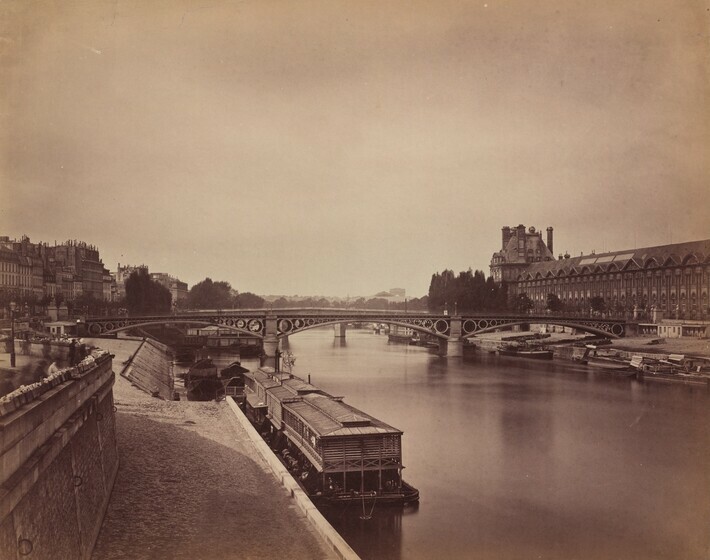 This photograph lucidly conveys both the spacious and elegant grandeur of this stretch of the Seine and describes the intimate details of daily Parisian life, such as the book and newspaper sellers at left who hawk their wares to passersby. 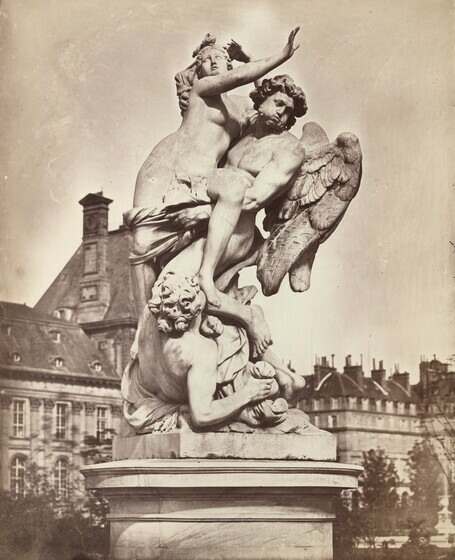 In 1859, Nègre embarked on a series of photographs sculpture in the Tuileries, the palace and formal garden complex next to the Louvre. This seventeenth-century garden sculpture represents the abduction of the Athenian princess Orithyia by Boreas, the North Wind. Nègre’s low viewpoint captures the dynamism and spiraling movement of the sculpture, while his use of a large-format glass negative yielded a print with brilliant, sharp detail and richness of tone. The Tuileries gardens and palace, which had suffered damage during the revolution of 1848, were extensively and lavishly restored under Napoleon III. 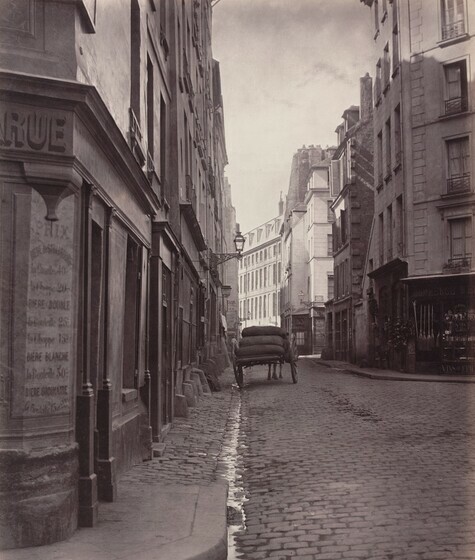 Named official photographer of the city of Paris in 1862, Marville was commissioned in 1865 to record the streets and buildings that the urban planner Baron Haussmann had slated for destruction. In this photograph of a small street in the Latin Quarter, Marville sensitively captures the light glinting off the water in the gutter, the dampness of the paving stones, and the play of light and shadow against building façades. 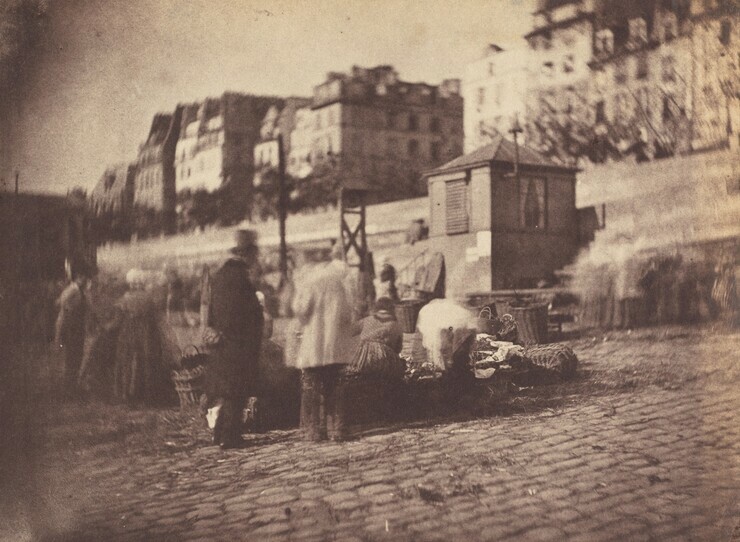 While these picturesque details charm contemporary viewers nostalgic for a premodern Paris, to planners like Haussmann they served as pictorial evidence of the insalubrious conditions of the city, with its inadequate sanitation and narrow, crowded streets that prevented proper circulation of air. Although gas lamps were in moderate use in Paris by the end of the eighteenth century, more than twenty thousand new lamps were installed in the 1860s and 1870s, thus effectively turning Paris into the City of Light. 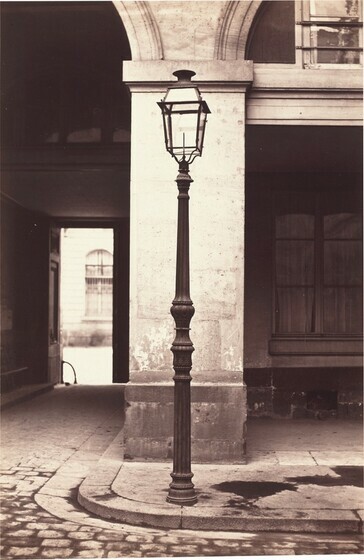 Marville was commissioned to photograph each of the ninety-six prototypes for the new lamps, including this one located in the courtyard of the Navy headquarters. In Marville’s formal yet lyrical composition, the lamp bisects the picture plane, creating an exquisite balance between light and dark and between surface and interior depth, beautifully conveying the theme of illumination. From the late 1890s to his death in 1927, Eugène Atget made over ten thousand photographs of Paris and its environs. Using a cumbersome, nearly obsolete tripod-mounted view camera, he recorded the myriad facets of urban life at the turn of the century, including old store signs and shop windows; desolate parks; architectural motifs; the narrow streets of old Paris; and the colorful characters who lived and worked there. During the last five years of his life, Atget photographed Notre Dame regularly, usually in the early spring before the trees bloomed. 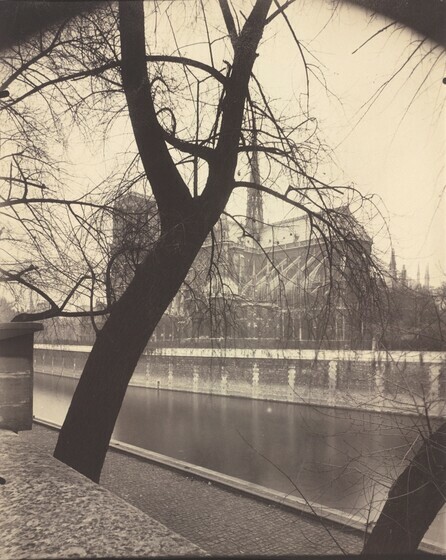 Selecting a vantage point that downplays the magnificence of the cathedral, in this photograph Atget creates a pictorial link between the cathedral's spire and flying buttresses and the tree's delicate skein of branches. 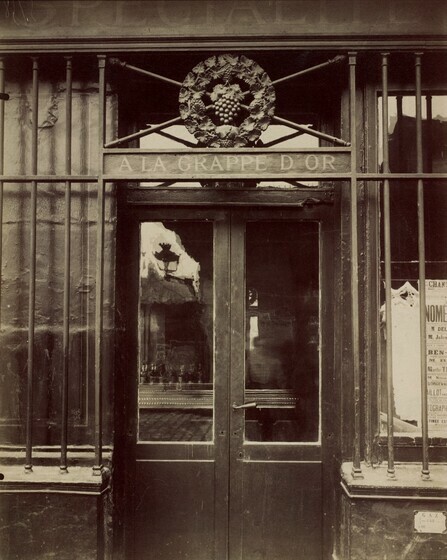 Atget continued to photograph well into the 1920s. Shortly before his death, his work came to the attention of surrealist artists who appreciated his ability to evoke meaning from the seemingly commonplace and banal. 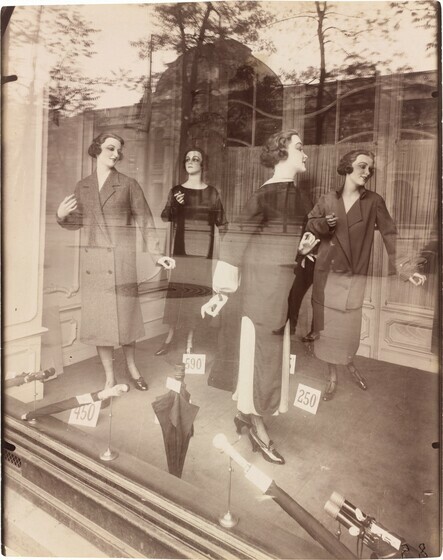 In Atget's photographs of desolate streets of old Paris and shop windows haunted by eternally gesturing mannequins, the surrealists recognized their own vision of the city as a dreamscape shot through with desire, memory, and anxiety. A fierce defender of photography's artistic merit, Alfred Stieglitz often experimented with different printing processes. 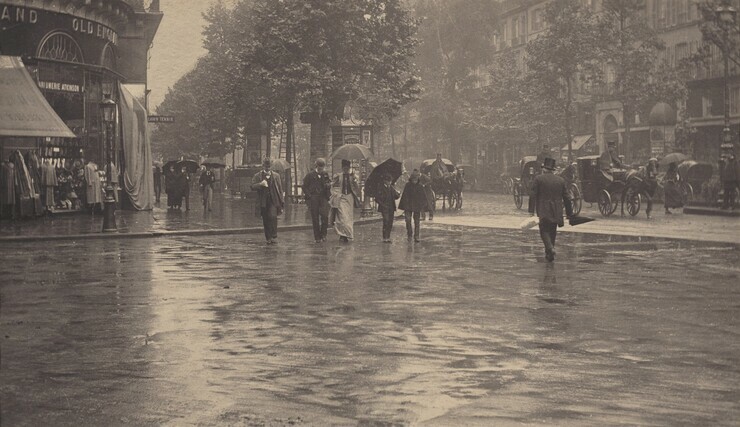 In this photograph of the busy intersection of the Boulevard des Italiens and the Rue Scribe — the heart of Haussmann’s new Paris — Stieglitz used textured watercolor paper in order to convey the rippled and shimmering appearance of a rain-soaked street. Born in Hungary, André Kertész moved to Paris in 1925 and immediately began to explore the city with his camera. In this photograph, a wooden carousel horse in an otherwise deserted Luxembourg gardens seems to oscillate between objecthood and animation, and points to the photographer’s playful sense of humor. This print is part of a series of photographs Krull took of the famous Parisian monument, then the world’s tallest building. While the other pictures in the series investigate the structure itself, this image is unique in that it represents the tower using nothing but its shadow, a transient mark on the surrounding landscape made indelible by the camera. Bing, who had studied mathematics and physics before turning to photography in 1929, worked exclusively with the 35 mm Leica camera, which came on the market in 1925. Thanks to its small size, fast shutter speed, and 35 mm film roll which could be rapidly advanced, the Leica enabled her to respond quickly to fleeting events and to experiment with unusual, technically difficult compositions—such as this aggressively cropped view through the tower's ironwork. 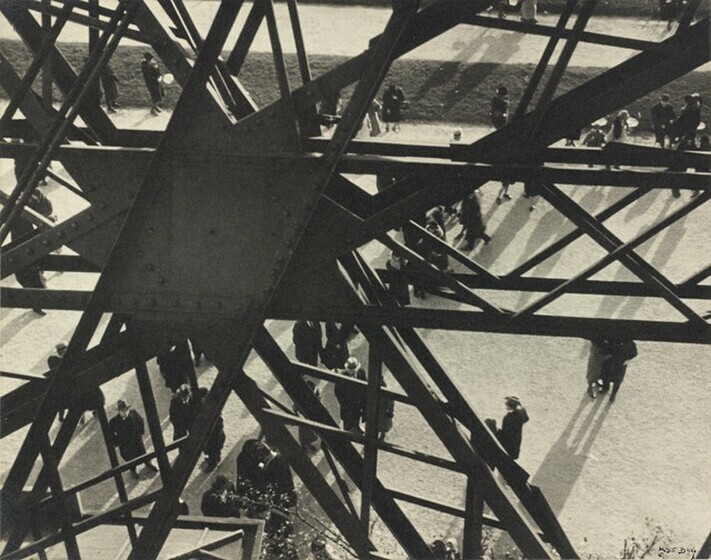 In 1929, Kertész as photographer and Brassaï as journalist collaborated on an article devoted to the fortieth anniversary of the tower’s construction. Rather than celebrating the structure’s technological complexity, Kertész’s photograph—originally published with the caption "The Ants"— focuses on the tiny figures that scurry between the shadows cast by the building’s intricate ironwork. 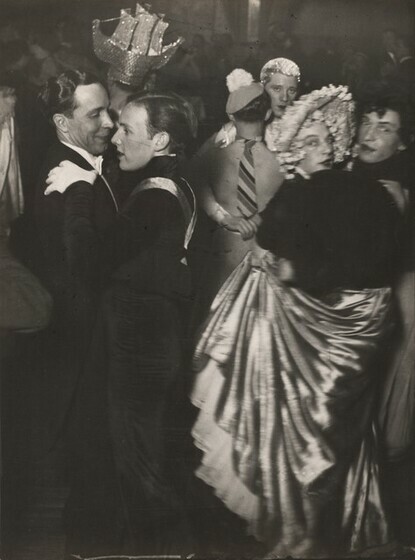 Brassaï was drawn to Paris's boisterous nightlife, chronicling both high society and bohemian revelers. Famous for its transvestite balls, Magic City Dance Hall fascinated Brassaï. He relished the impromptu of an "immense, warm, impulsive fraternity" without regard to class, race, or age. Attracted to their louche atmosphere, Brassaï frequented popular dance halls that were located in a working-class neighborhood. In this photograph, Brassaï's compositional skill is evident in the way he has framed his subjects, with the woman's profile reflected in a mirror. The combination of artifice, playfulness, and formal elegance suggests that, despite the air of spontaneity, this photograph—like many by Brassaï—may have been staged.